July 18, 2009 .Reading time 2 minutes. It’s time to part ways with one of my sewing machines, and I’ve decided that the Pfaff Performance 2054/2056/2058 has to go. I’m not selling it because there’s something wrong with it (there isn’t) or because it’s not a good machine (it is) or because I don’t like it (I do), it’s just that I can do everything with the Bernina that I can with this Pfaff, and I just like the Bernina better. June 25, 2007 .Reading time 7 minutes. For the last two (or maybe more) weeks, I’ve been trying to design the outer borders for the bird quilt (a.k.a. “The Misery Quilt“). I really thought it needed some curves in the outer border(s), and maybe some more embroidery of some sort as well. I did test stitch-outs of a couple of embroidery options, and just didn’t have that “this is it” feeling about any of it. I played around with a diagram of the quilt, drawing curved appliquéd borders, viewing with mirrors, and just wasn’t terribly happy with any of it. I tried designing an appliquéd border without planning any embroidery to go with it, and still wasn’t happy with it. After a few really grouchy days (I get like that when I’m creatively stumped), I finally threw in the pencil, and headed to the bookshelf for inspiration. 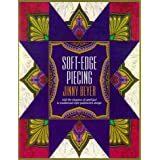 As I’d already been through all my books on borders and design, as well as all the books like the MAQS Founder’s Collection with all its prizewinning beauties, I pulled out Jinny Beyer’s Soft Edge Piecing for starters. I’m working with a border print and the soft edge piecing technique was in the original plan for the quilt way back when, maybe ten plans ago now. I really didn’t expect to have a flash of inspiration at that point, but desperation had set in. May 23, 2007 .Reading time 3 minutes. April 10, 2007 .Reading time 7 minutes. 2 x Nadine! Coincidence, or just great minds thinking alike? March 25, 2007 .Reading time 2 minutes. Nadine took my machine quilting class a few years ago, and bought the Pfaff 2056 in December partly because I had it, and because of some of the features the machine had. She never fell in love with it for machine quilting, but I didn’t know it. So she made the decision to buy the Bernina 440, and she is now happy with both machines. I think I will be the same: using the Bernina for machine quilting, especially the free motion, and using the Pfaff for piecing and machine guided quilting since it has the IDT (or dual feed). I also bought the embroidery unit for the Bernina, to replace the Pfaff 2124 sewing/embroidery machine that I sold! So, 2 Nadines + 2 Pfaff 2056 machines + 2 Bernina 440 machines = 2 great minds thinking alike! !